Oyster lovers have quite a few requirements when it comes to enjoying this delicacy and we’ve found the top spots in Connecticut that can meet those demands. Customers want the freshest fare along with a wide variety of local shellfish sources and creative options when it comes to flavor enhancements and preparation. They also like a professional staff expert in shucking those stubborn shells and who can advise on a wide variety of seafood options. A great view and a cozy patio get bonus points. Here are 10 terrific places to try. This venue offers the enticement that diners can “eat like a Viking” and that sure sounds like a good time. The club offers boat-to-table fare and promises the finest, freshest and most sustainable ingredients. While the space is described as rustic-chic, it’s also a romantic spot, especially outside on the deck. After all, oysters are known for their aphrodisiac properties, so anything is possible if you decide to indulge in these sublime and tasty treats. With a little luck you might show up on "buck a shuck” night and that will make this outing just about perfect. This establishment prides itself on bringing the community to the table by offering a warm experience best shared with family and friends. Locals love the place and that’s always a good sign, especially in an area that has plenty of options for seafood. The menu changes with each season and that’s why customers will find the freshest ingredients, according to the owner who also serves as executive chef. Of course, Liv’s offers oysters on the half shell, but you might also want to try specialties such as the Oyster’s Casino appetizer—baked Blue Point oysters, bacon, and herbed butter. Fresh is the word when you pull up a chair at this table. The food is prepared to order and although you might have to wait a little longer for your meal, be assured that there is no pre-breading or pre-cooking and no microwaving from frozen, say the owners. The Maine Fish Market building dates back to the 1780s and is one of the oldest commercial buildings in the state. Besides an extensive menu, featuring all your raw bar favorites, to eat on site, make sure to check out the retail counter before you leave. Why not take-home live lobster, shucked oysters, sea scallops or cocktail shrimp to enjoy later? If you’d like to experience a modern twist on classic American seafood, Max’s is a must try. Here you’ll find ethnic influences and new interpretations of traditional fare. 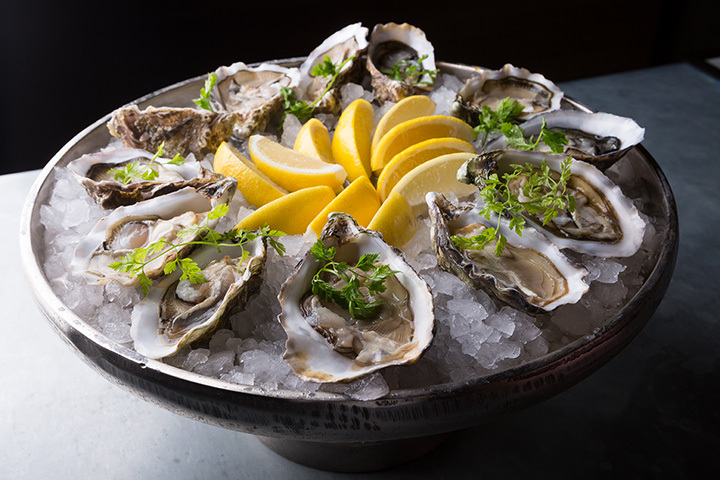 The raw bar boasts an amazing variety of bi-coastal oysters and shellfish. Dedicated to quality and with a long history and sure hand in the preparation of your favorite oyster appetizers and seafood entrees, it’s all served up in a setting that offers plenty of ambience. At this neighborhood oyster bar customers will find oysters that are super fresh and clean and—and as the place itself says—shucking amazing. The menu is full of items that come from the Connecticut shoreline and local farms and the preparation ranges from vibrant flavors to good old-fashioned comfort food dishes. Beyond its raw bar, Lucas Local offers an open wood-fired kitchen and craft bar that serve as a gathering place for new and old friends. If the world is your oyster, here you can choose from Blue Point, Sweet Petite, Little Neck, Alpine, Wellfleet and more. A casual and contemporary setting is the background for this oyster mecca. The fun and friendly atmosphere brings together a bit of European bistro flair and New England tradition mixed with some New Orleans French Quarter spice for an altogether unique experience. Oysters are just one of the specialties on a diverse menu that makes this spot a definite destination for food lovers. Be sure to check out the spacious bar when you stop in. If you’re visiting the Gold Coast, why not go for the gold and step into this well-revered eatery for your oyster fix. The menu features daily fresh-from-the-sea choices on the oyster front and you’ll have trouble making up your mind as you peruse the many options for how you’d like to chow them down. Perhaps pan-fried or atop a salad? See what the chef has whipped up today! Ask the staff to help you find the perfect wine to pair with your seafood as you relax and take in the mural and other lovely décor in the intimate dining room. When it comes to fruits de mer, as the French might say, the Whelk is going to impress with its upmarket sustainable seafood prepared with local produce. Your selection will be brought to the table with a bit of the wow factor in its creative presentation. The dining room is airy and there’s the option of outdoor seating when the weather cooperates. This raw bar offers a fine variety of locally sourced oysters that will inspire you to have just one more. If you’re in the mood for an old-school outing along with your sea snacks, you can’t do better than Crabby Al’s. The only catch is, the raw bar—hosted by “Joey Clams"—is only available Thursday evenings 5-9 p.m. The Blue Point oysters are the highlight but there are plenty of other options for seafood lovers and those who aren’t. So, if you want a bit of fun and an adventure, pencil that into your calendar. With a deck overlooking the Naugatuck River and a big dining room inside, you’ll find a place to sit back and soak in the atmosphere. Before dinner, why not plan to stop by the Railroad Museum of New England right next door or take a stroll around this quaint downtown village? For those seeking an elegant, yet all-American, restaurant experience that offers fine fare for oyster aficionados and meat eaters, too, look no further. If you want it all, this could be your go-to place. With daily deliveries of “guaranteed fresh” seafood, the a la cart offerings make for a perfect start to your meal. Or, if you are in the mood for a splurge, check out the Chef Tower masterpiece that brings all your favorites, from lobster to shrimp, clams, crab legs, oysters and more to your table.